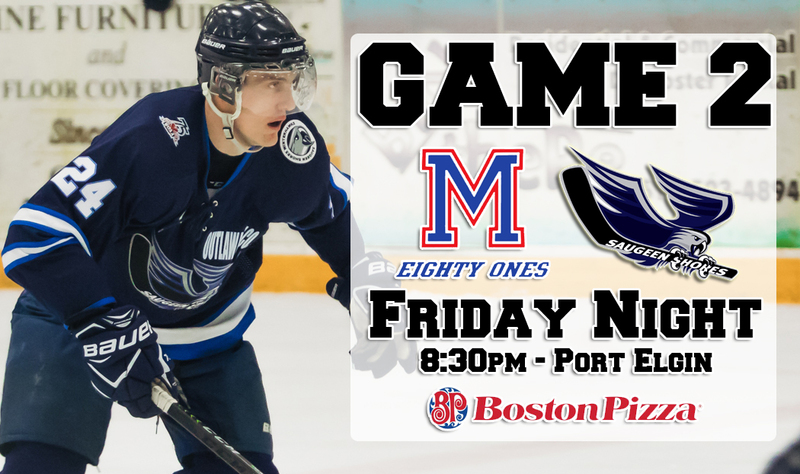 Game 2 Sponsored by Boston Pizza – Friday Night! The Saugeen Shores Winterhawks and Minto 81’s will resume their Sr. “AA” playoff series this Friday night with Game 2. After being snowed out a week ago, Boston Pizza Saugeen Shores will once again sponsor the game. Boston Pizza will be raising funds for the Saugeen Memorial Hospital Foundation, every $2 donation gets you 50% off your next pizza plus the chance to win a $50 gift certificate, which will be drawn during the game. Game 2 gets underway on Friday night at 8:30 p.m. at The Plex! Please note – the series schedule has been modified to reflect the cancelled game last weekend, the Winterhawks will host Game 4 at home on Tuesday, February 19th at 8:30 p.m.